All Saints sits rather shyly behind its trees in the company with a few other old buildings at one end of All Saints Green. Some of the excesses (though by no means the worst) of Norwich's 1960s attempt to become a kind of East Anglian Wolverhampton glower inhumanely down to the south. The church does well to ignore them. 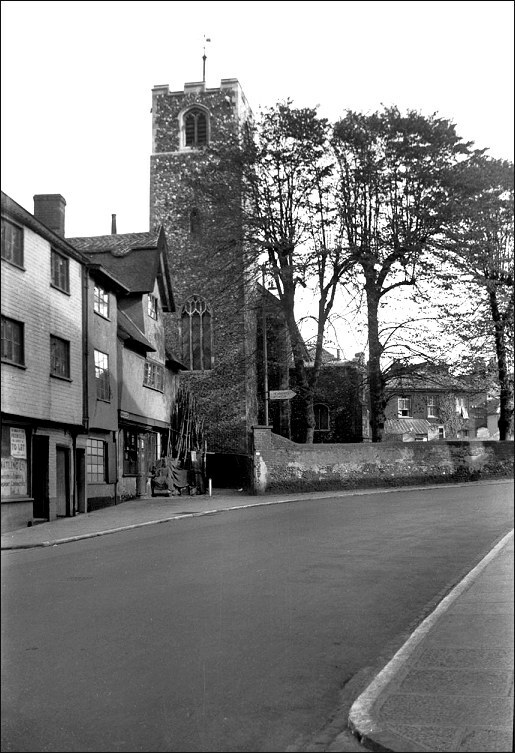 Amazingly, the buildings to the west of the church survived both the blitz and Norwich City Corporation, and the view up Westlegate is substantially the same today as it was in George Plunkett's 1938 shot on the left. 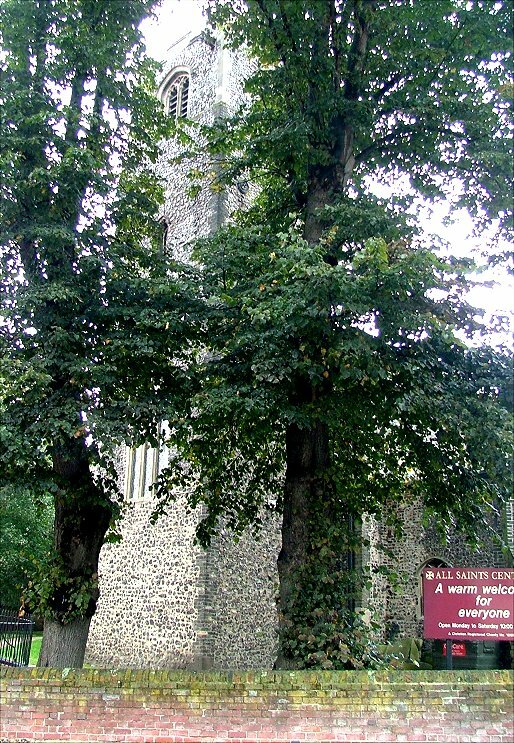 All Saints is a typical late-15th century church on a small scale - a Norfolk village church in the heart of the city. The tower is patched up, the very top being from just before the First World War, and the Victorians are responsible for the rather run of the mill 'Decorated' east window. 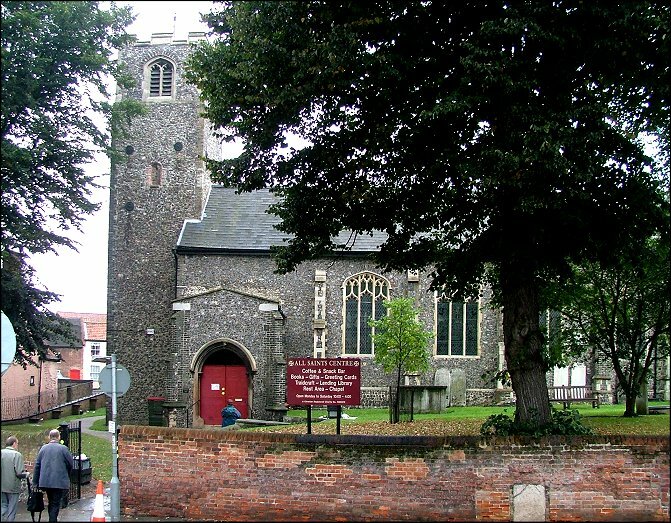 However, All Saints was noteworthy for being one of the most extreme Anglo-Catholic churches in a city famous for them. It lasted until 1973, when the reorganisation in the light of the Brooke report led to its closure. 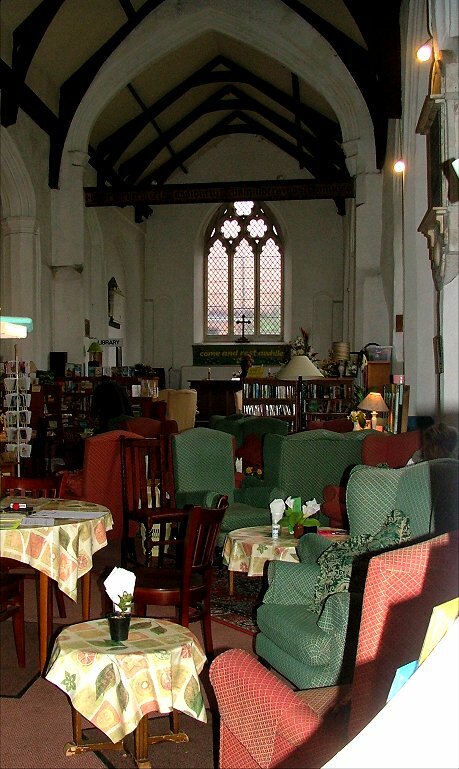 Since then, All Saints has been reinvented as a daytime drop-in centre, and it is one of several similarly appropriate reuses of a medieval church in the city. Volunteers staff a cafe, library and rest area that is widely used by passers-by, but is particularly welcoming to the insecurely housed and economically disadvantaged. It is a Christian hospitality that should be practiced by as many other churches as possible. All walks of life meet here. 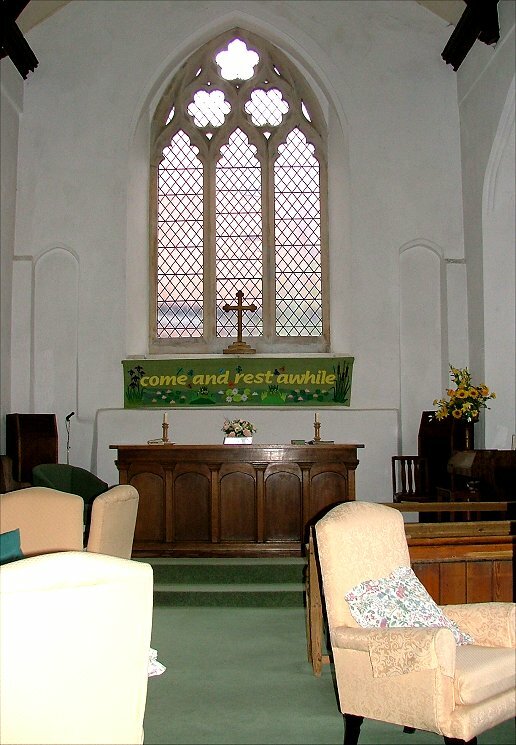 The interior is homely without being shabby, and the view to the east remains a devotional one, as you can see by comparing George Plunkett's 1938 photograph, and mine of 2005. 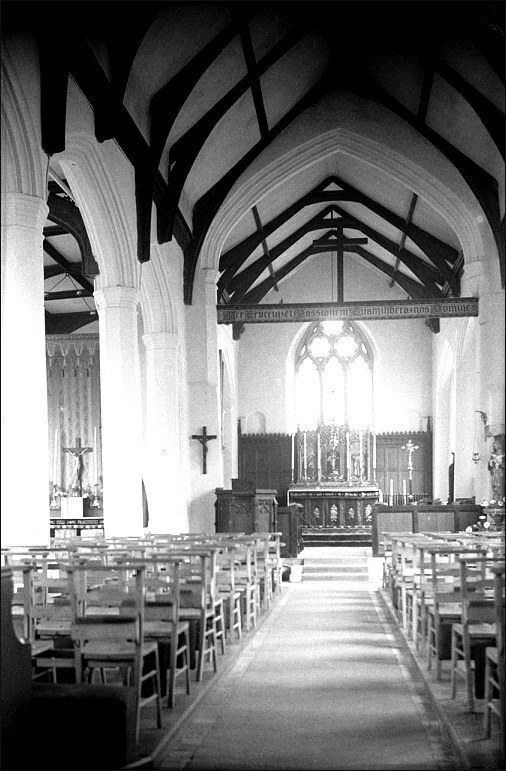 In the early 1970s, shortly before redundancy, Roger Smith took the two photographs on the left. 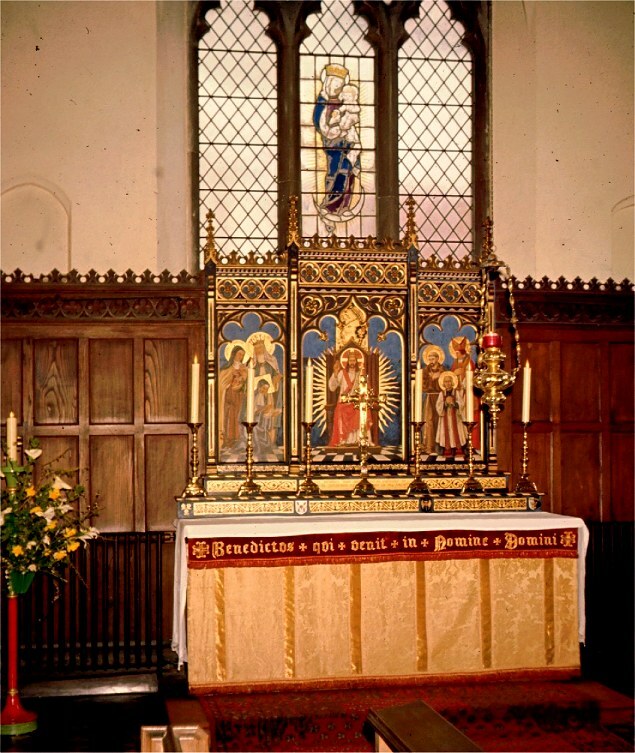 The brightly coloured Triptych above the altar featured Christ in Majesty in the centre, with St Therese of Lisieux, Mother Julian of Norwich and the Blessed Virgin Mary on the left and .St Francis, St Felix and St John Vianney on the right. 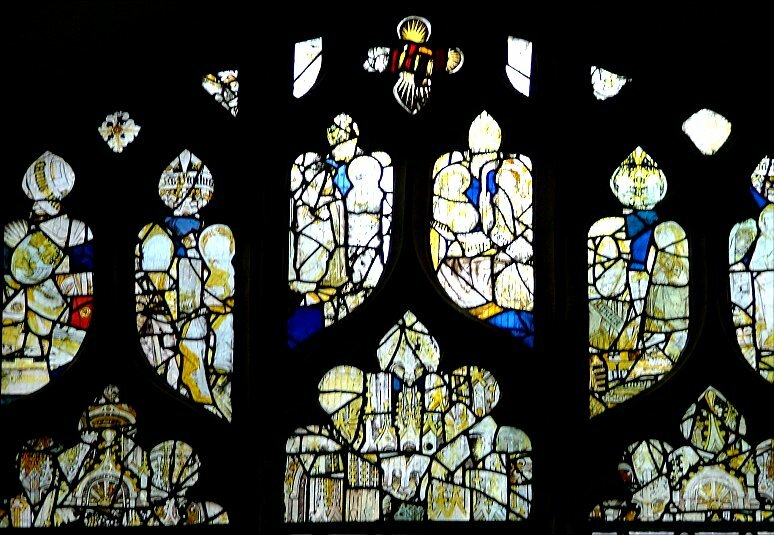 It can now be seen on the nave wall at East Tuddenham. 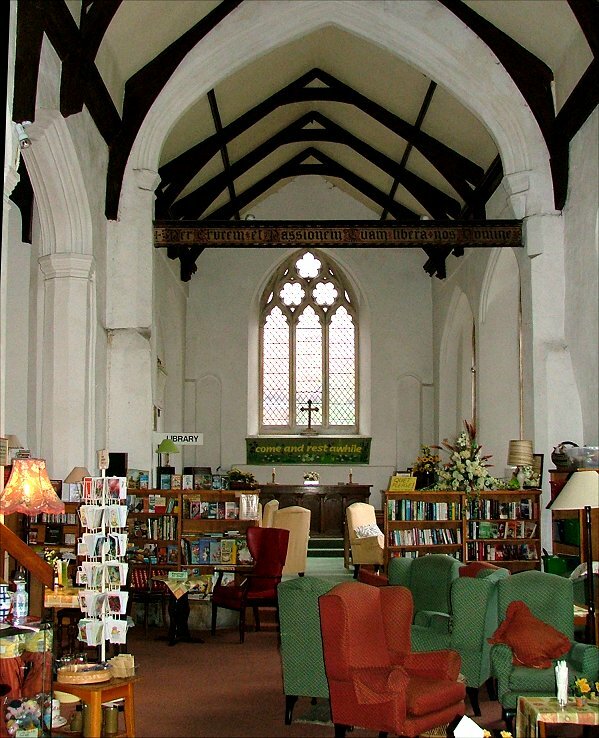 The image of the Madonna and Child by Martin Travers in the window above is now around the corner at St John Timberhill. 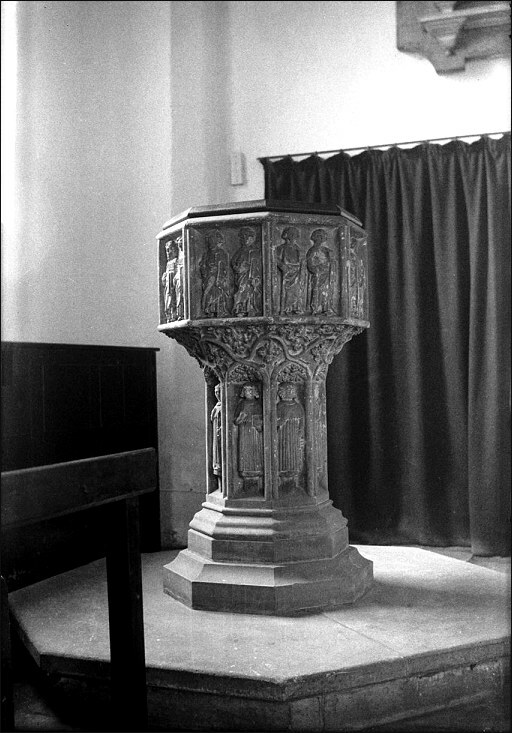 At the other end of the church was once one of the city's most spectacular fonts, with Saints arranged around bowl and base. This went to St Julian to replace the one destroyed by bombs there. 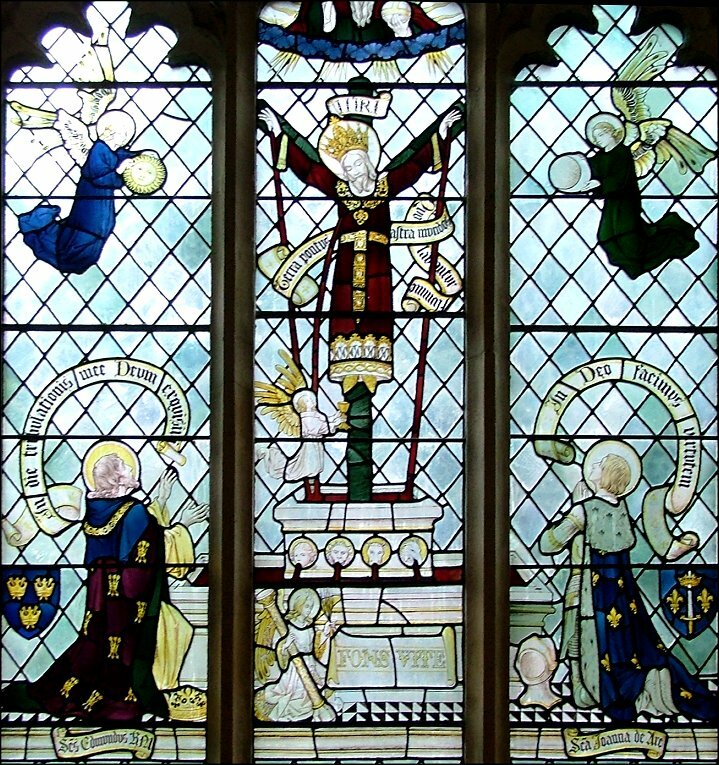 Some survivals of the Anglo-catholic past survive, including a superb 1920s south nave window of the crucifixion. 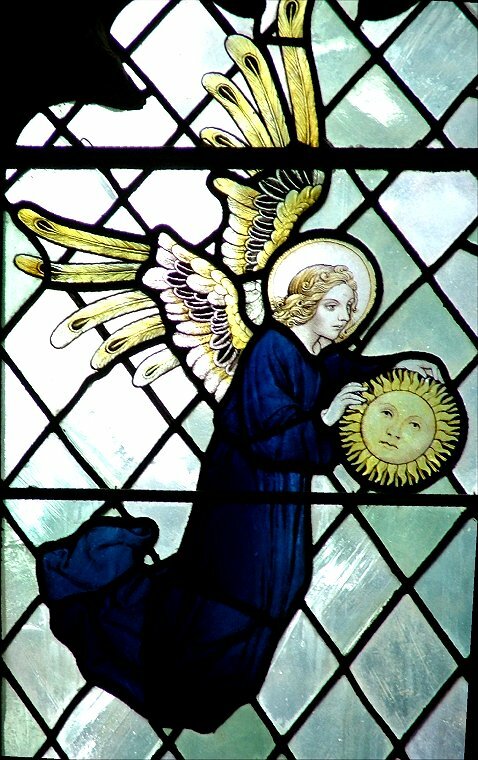 Flanking angels hold the sun and the moon, while angels at the base collect the precious blood. 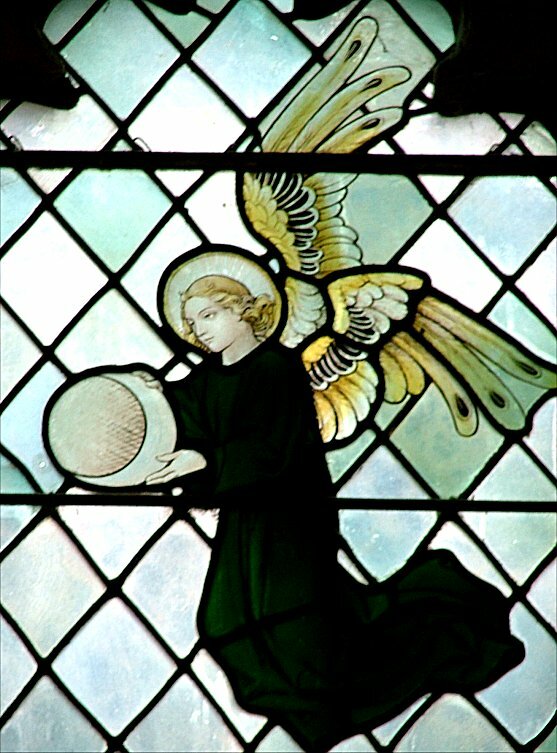 There are medieval angels in the upper lights of one of the north aisle windows. 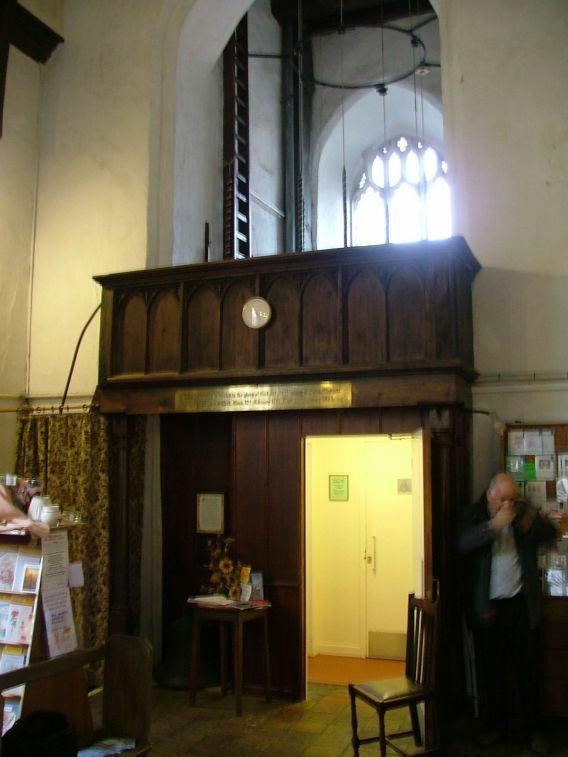 Everything else has gone, although by way of recompense the 18th century wooden gallery from St Saviour came here, and is now the base of the ringing chamber and roof to the kitchens. 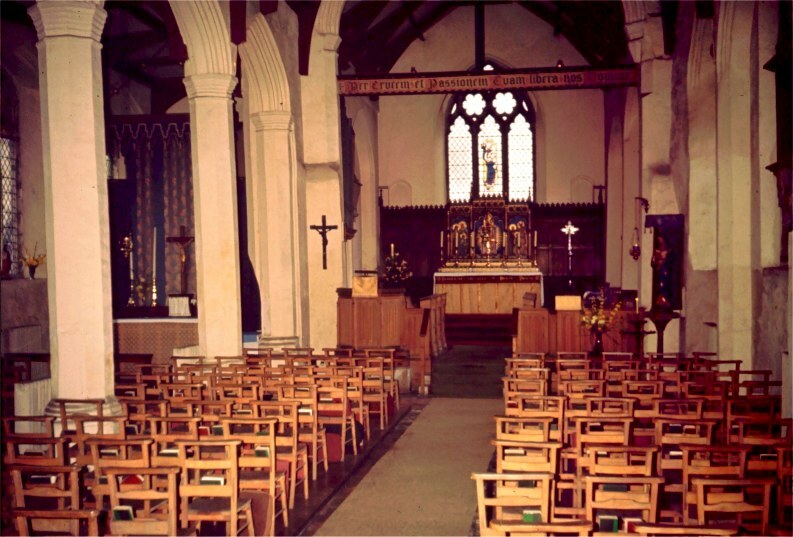 All Saints has never been deconsecrated, and the chancel has been reordered as a chapel. 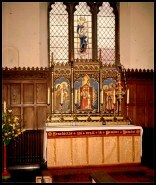 Come and rest awhile, reads the reredos. This, of course, is a central part of Christ's teaching that is all too easily ignored by locked churches and suspicious keyholders. But the kind ladies staffing the kitchens here will have their reward.